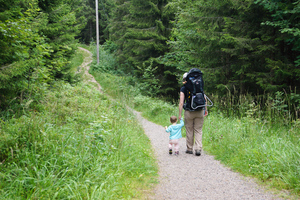 Having done all the plausibly necessary prep , Jonathan and I set out for our first backpacking/camping trip with our 15-month-old daughter on a sunny Saturday in July. 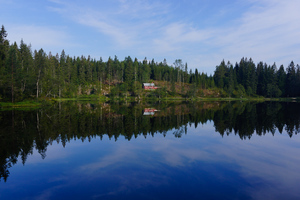 Our destination was a little lake called Skjennungen , approximately 5km from Frognerseteren (depending on the trail you choose), at the end of the 1 Tbane line. We've camped there sans baby twice before. 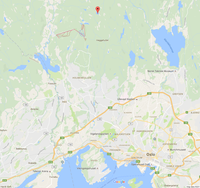 It's close to Skjennungstua , an unmanned hytte on top of a hill, which gave me some comfort in the event of a freak thunderstorm or baby-related emergency. There are also trashcans near the hytte, which meant we could unload some waste weight before the longer hike home on Sunday. Our route took us out by way of Ullevålseter , a manned hytte, where we planned to stop for a coffee break. Total distance over two days was only about 12 km (7.5 miles). Click to enlarge the map below. In Jonathan's pack (32 pounds) : tent, sleeping bags, sleeping pads, warm clothes for the kid, extra socks for all, books for all, food for one breakfast, one lunch, and one dinner, a backpacking cook stove and pot, plastic cups and sporks, water pump and filter, camera, and extra backpacking-related stuff (small lantern, waterproof matches, knife, etc.). In my pack (40 pounds) : a 15-month-old Cheeks McGee, water for all, first aid kit, trail snacks, diapers and wipes and waste bags, the kid's favorite stuffed animal. A smart move. Previously, we'd found spots in the heavily wooded area around the lake that worked for us, but this lake spot had plenty of flat, open spaces for the tent, as well as easy access to water, large boulders for sitting and stable food prep, and an idyllic view. Tent up, pads down, bags in. 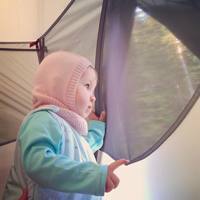 The MSR Mutha Hubba is an excellent family tent. Plenty of horizontal room for three sleepers. (Extra, of course, when you've only got two and a half.) Plenty of vertical room for sitting up to read or chat. Airy without the rainfly on, but we weren't taking any chances, so we put up the rainfly and dealt with the tent being a little warm for a while. The toughest part was getting the babe to sleep. McGee has been a solid 7-to-7, no-waking sleeper since she was 5-months old. Bedtime at home starts with a regimented routine including dinner, bottle, bath, story, and a quick lullaby. No tears. Most nights she actually points to her crib mid-lullaby to move things along. I leave the room while she's still awake and don't hear from her again until 7am. I know. Insane. And awesome. We sleep-trained. That's a whole other story. The thing is, I wasn't sure how any of this would translate to sleeping in a tent with her mom and dad. We never co-slept, so this is a totally foreign thing for all of us. We attempted some semblance of her usual routine around 8pm, and I intended to stay in the tent to help her fall asleep. This totally threw her off, and she stared at me quietly for almost 10 minutes while I sang and pretended to sleep next to her. Then she got up and started crawling around the tent. I tried putting her back down and leaving the tent. Jonathan and I watched the sun setting over the mountains across the lake while listening to the babe rustle the sleeping bags. This also lasted about 10 minutes before she started to cry. Next we both tried getting in and reading beside her. She was obviously tired, but totally confused, and began doing laps around the tent, rolling around at different points trying to get comfortable. We let her have a book, too, and read it to her a few times hoping she'd fall asleep that way. No dice. It took me more than an hour to consider that a little containment might help, since she's used to sleeping in a crib, not a big, open tent. She protested for a minute or so after I snuggled her up between Jonathan and me and restricted her movements to that space, but then relaxed. Another ten minutes of lullaby-time later, she was fast asleep. By then it was almost 11pm, a full 4 hours later than she usually goes to bed. I was able to leave the tent to go to the bathroom without waking her; Jonathan and I even talked for a while inside the tent. She stayed asleep with a couple of exceptions--brief wakings at midnight and 4am which included her sitting up, saying, "Dada!" with surprise and enthusiasm, then flopping over and falling deep asleep again--until 7am. Unbelievable. Here I'll mention that, for a sleeping bag, we used a thick Vertbaudet sleepsack with attachable sleeves . She always uses a sleepsack at home, so this didn't require any adjustment. Though the tent was warm when we went to bed, the night was chilly, so I had bundled her up, including a lightweight, wool balaclava-style hat, the one that makes her look like Baby Joan of Arc. Her hands were still cold to the touch throughout the night, making Jonathan and I wonder if we should try bringing mittens along next time, but overall, she was perfectly comfortable temperature-wise. Had we known that, no matter how long it took, once asleep, McGee would then sleep through the night, I think both Jonathan and I would have slept better, too. As it was, we were both on high-alert the whole time. We woke at the slightest shift of anyone else in the tent. When we did doze off, we were restless. It didn't help that the rest of our camping gear is more than a decade old and well-loved, so one sleeping pad had sprung a leak, among other minor inconveniences. Still, we managed a few hours of shut-eye. 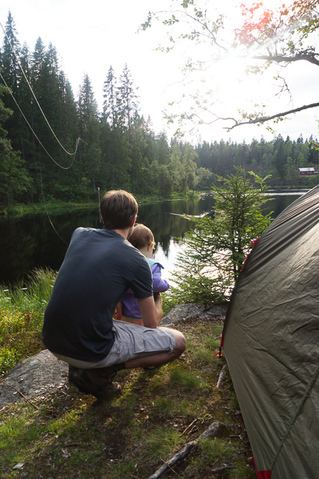 Dawn came, and we woke to a pristine mountain lake, a clear sky, and our daughter asleep between us in the tent. She lay on her stomach on the sleeping pad, cheek pressed flat, lips like a pink bloom in the morning light. That magic alone was enough to make the whole trip worth it. The fact that she woke with a huge smile, elated to find herself still in a tent with both her favorite people, was gravy. We took our time getting ready to go, and the process reminded us very much of the old camping trips we took pre-parenthood. Jonathan boiled water for coffee, tea and the baby's grøt. 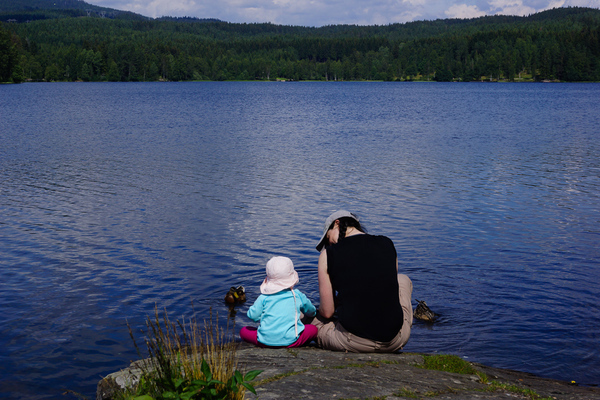 We sat on a large boulder, barefoot, gazing out at the glassy lake and mused about the difference between crows and jackdaws, and the baby babbled in agreement. 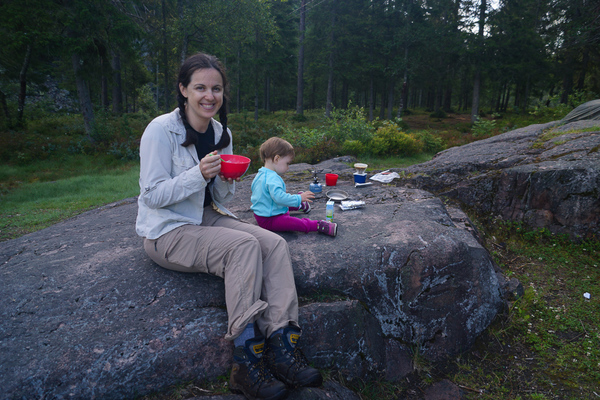 We ate cold Pop-Tarts (a splurge here in Norway, but it reminds us of home) while the baby drank a boxed juice. Then we packed up the campsite--leaving it cleaner than we found it--and prepared to go. Here, the McGee surprised her parents by figuring out the Camelbak to quench her own thirst. 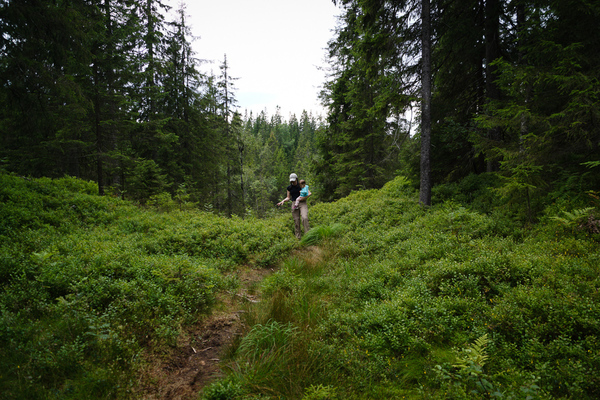 The hike to Ullevålseter was a breeze. It's a straightforward trip we recommend to all our friends in Oslo. 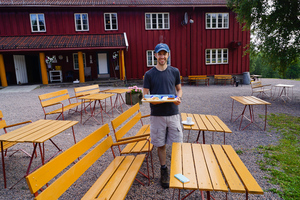 There's nothing more uniquely Norsk than stopping at a hytte mid-hike for coffee and waffles with brown cheese. 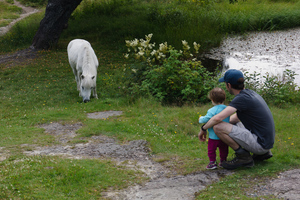 There's also a white pony who lives on the property, and that gave the McGee yet another new animal encounter! 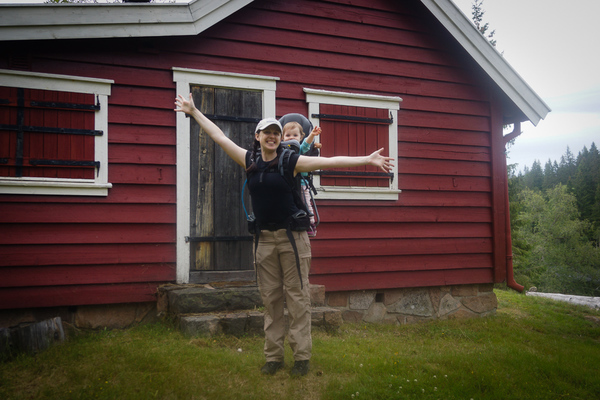 Headed down to Sognsvann on the final push, the babe surprised us again by taking a 40-minute nap in the backpack! Afraid to stop, lest the lack of motion wake her, we did the last 5 km with no breaks. She opened her eyes as we reached the end of the lake and found a picnic table for lunch. We tossed our stale sandwich crusts to the ducks and hurried to catch the 3 Tbane home. I will be writing a third installment in this series on our personal takeaways. We learned a lot, and we're already planning a second trip. If you've got specific questions about the experience or the ins and outs of getting into the Oslomarka from town, please leave a comment. Thanks!